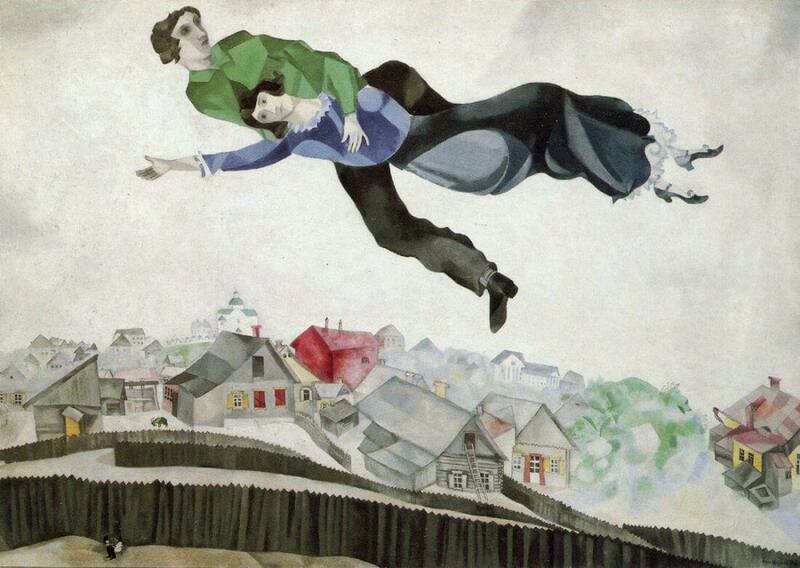 Over the Town shows Chagall and his wife flying above Vitebsk, which is a small town where he grew up. 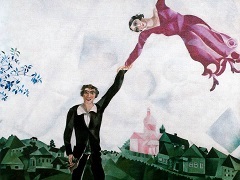 Chagall is holding his wife close as she waives one hand open through the air. The homes below them are all the same color, except for one red house in the background. There are also wooden fences present around most of the homes. The sky is more of a white than a blue and both people are wearing darker clothes to make them stand out among all the light colors. 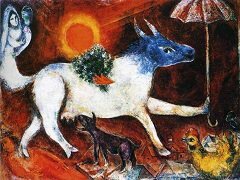 Chagall enjoyed creating pieces that showed him and his wife, Bella Rosenfeld Chagall, flying around in the air. 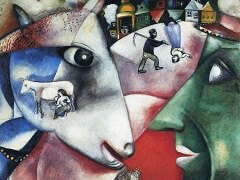 Over the Town is a celebration of their love and how they became unified as a couple once married. I suddenly felt as if we were taking off. You too were poised on one leg, as if the little room could no longer contain you. You soar up to the ceiling. Your head turned down to me, and turned mine up to you... We flew over fields of flowers, shuttered houses, roofs, yards, churches." The feeling was mutual. 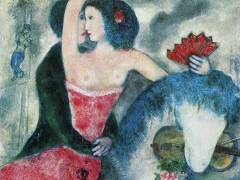 The artist painted a series of pictures celebrating their love. 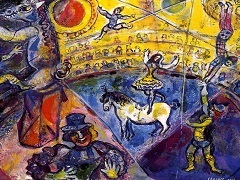 Some of them are pictures of flying and, as in Goldenberg's description, there is no "as if" about it. His images take the romantic metaphors of feeling lighter than air, being uplifted, soaring, swept off your feet quite literally. 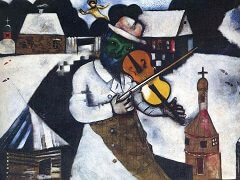 Over the Town is currently located at the Tretyakov Gallery in Moscow, Russia.